What’s hanging on my walls …. I suppose people often wonder what hangs on an artists walls. Have a little peek into my private space. All my adult life I have been fascinated with buildings. Houses and homes in particular. I have been interested in tribal arts and crafts as well. I like to "BUY HANDMADE"it is important to me because "owning something handmade is like holding a little piece of heaven right in your hand. " The essence of the artist remains in the piece forever! 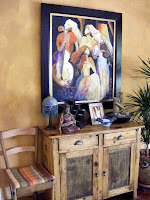 I am interested in houses, styles, tribal and handmade crafts and decor from all over the world. I have travelled to many countries and along the way collected a little something from them all. I also hang sentimental pieces of art and collectables on my wall. 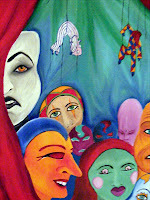 Below is a painting done by my youngest daughter. I have a gypsy spirit and have moved many times in my adult life. I have lived in 17 houses since I was a student (ALOT) and I don’t think I’m THAT old.. 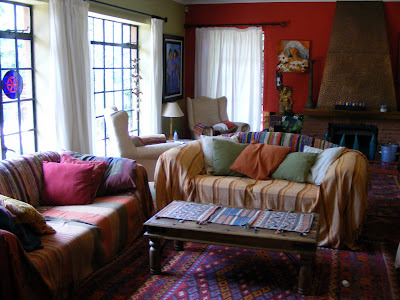 When the nomad in me stops for a while, a home is purchased and the redecorating and fixing starts. Its fun and I absolutely love it. To change spaces into happy places is my best. I love houses and buildings. Pop in for tea if you’re ever in the area. Not possible? Send me a mail and chat instead. 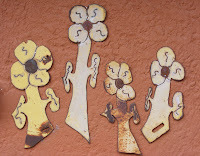 A flower garden made from recycled metal from trashed cars. Whats hanging on my wall? Lizards from Bali. Intricately painted. 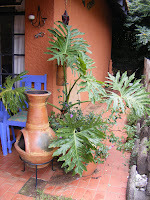 Chimenea from Mexico. 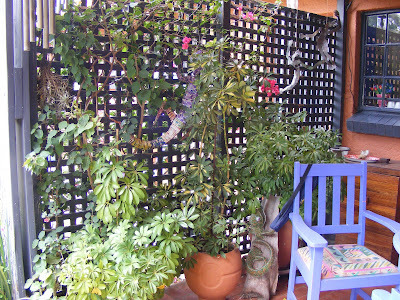 (not hanging on my wall) In amoungst the trellis work are lizards made from recycled soda cans. I love mosaic work .This is outside my Kitchen, I still have to complete to whole walkway but its back breaking work. Inspiration -Gaudi's mosaics in Barcelona. Breathtakingly beautiful. This too does not hang on my wall!!!! I have recently changed the colour of my lounge and I think it looks fabulous…A sea moss green .. The painting above the coach is a "family portrait." I painted it shortly after moving into our house. 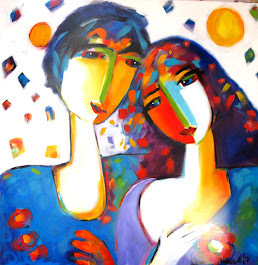 Richard and I are in it, our children are in it , the dogs, flowers , plants, the sun , the moon, feathers , a chameleon, a bottle of wine, a tea pot and cups, colourful cloth that I love to collect. 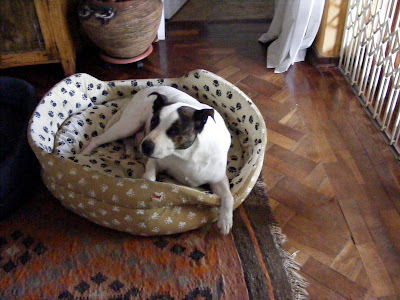 I do however have a small handwoven rug in the entrance hall that I bought in New Mexico. 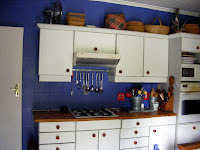 Whats hanging on my wall in the Kitchen.... well utensils. 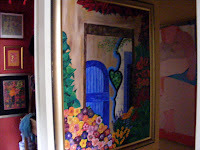 Of course my paintings are all over the house. This one is called "String Quartet"
I have converted my lounge into a gallery where I showcase my art. 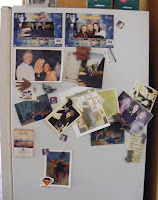 This is a messed up family gallery..Not on the wall ...on the fridge... photies of us.. 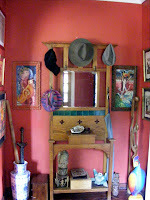 The entrance hall has a collection of paintings and nicknacks we have collected over the years. Hand made figurines by the Greenside High School Grade 10 Artclass of 2003, are placed on the window sill in the bathroom. 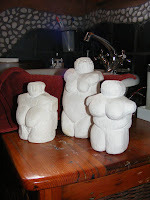 The inspiration for this project was the prehistoric sculpture "Venus of Willendorf." 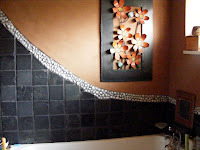 The bathroom.. handmade metal sculpture hanging on my wall. 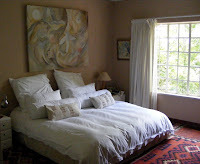 One of my paintings hangs above the bed, in the main bedroom. 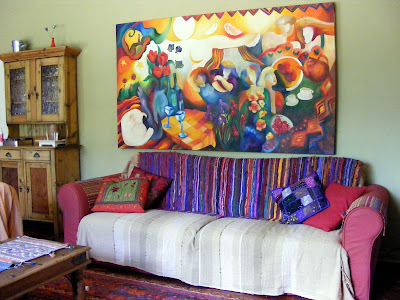 As an artist I have far more things that hang from my walls, the ceilings, the trees, but here I have only given you a glimpse of my space and what hangs on my walls. Please scroll right to the end I can't rid of this space!!! !